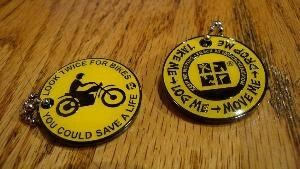 (TB2QA87) Look Twice Geocoin - Todie's Wild Ride: Check Em Twice! Todie's Wild Ride: Check Em Twice! Use TB2QA87 to reference this item. 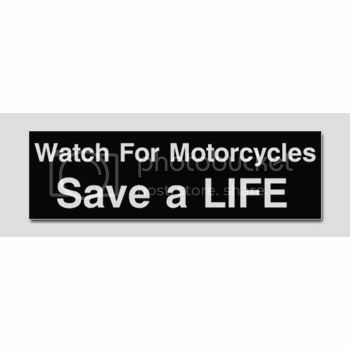 This mission of this coin is to raise awareness for motorcycles sharing the road with other vehicles and the importance of proper tire inflation. Always keep the motorcycle manufacturer's recommended air pressure in both tires. This is an important requirement for tire safety and mileage. Your motorcycle owner’s manual will tell you the recommended cold inflation pressure. On some motorcycles, the recommended front and rear tire pressures will be different. The pressures stamped on the sidewall of the tire are only for maximum loads. On some occasions, these pressures will also be the manufacturer’s recommended settings as well. Riding on tires with too much air can be dangerous. The tires are more likely to be cut, punctured, or broken by sudden impact. Do not exceed the pressure indicated on the tire sidewall. Consult your owner’s manual for the recommended inflation and other tire information. Never inflate a tire unless it is secured to the motorcycle or a tire-mounting machine. Inflating an unsecured tire is dangerous. If it bursts, it could be hurled into the air with explosive force. Gallery Images related to Todie's Wild Ride: Check Em Twice! I'll add a few miles to this today.